RHS Wisley’s Light Festival is Gorgeous! I have been trying to get to the Wisley Festival of Light for the past 2 years and was very pleased to have finally made it on Wednesday evening. The lingering snow on the ground and cold temperatures really made it magical and exciting, reminding me very much of how I felt as a child when Christmas was just around the corner. I coordinate one of the local Society of Garden Designer’s Cluster Groups where members of the society get together and discuss topics relating to garden design. 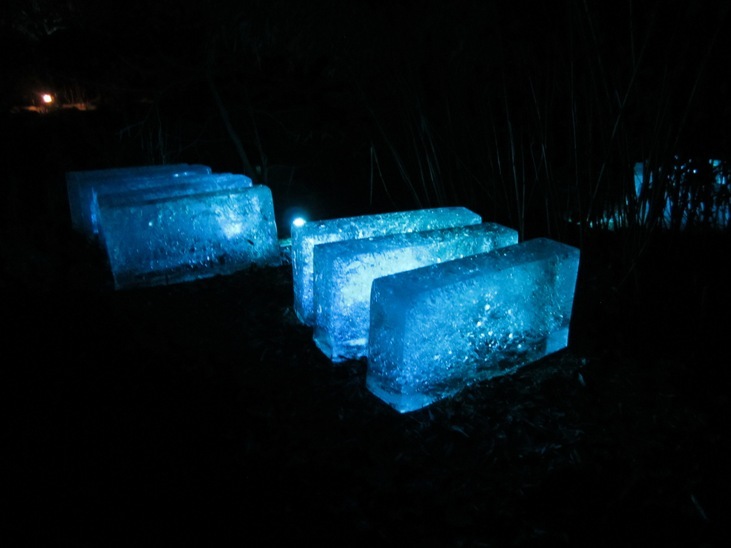 The visit to Wisley formed part of our Christmas get-together as one of the members of the group, Andrew Fisher Tomlin, has been working with the RHS to incorporate the 2 ice installations that form part of the light festival. Andrew talked about the inspiration for the installation, how he wanted to step outside his comfort zone and create something that he had no control over, something that potentially could be a complete disaster! The weather of course has been really fantastic for such an experiment because the cold weather has prevented the ice from melting too quickly. The slabs above were installed on Monday and you can see that by Wednesday evening they had melted a little and become cracked which created a beautiful effect when the light shone through it. The thinking behind their layout was to try and create a dominoes effect so that as they melt, they fall on the next one, the fun of course being that no-one can be sure how they will behave as the melting process continues. It will be really interesting to see what happens so I am hoping to get back there for another before the festival finishes on Sunday. It is experiments such as these that really test new ideas in the design sphere. 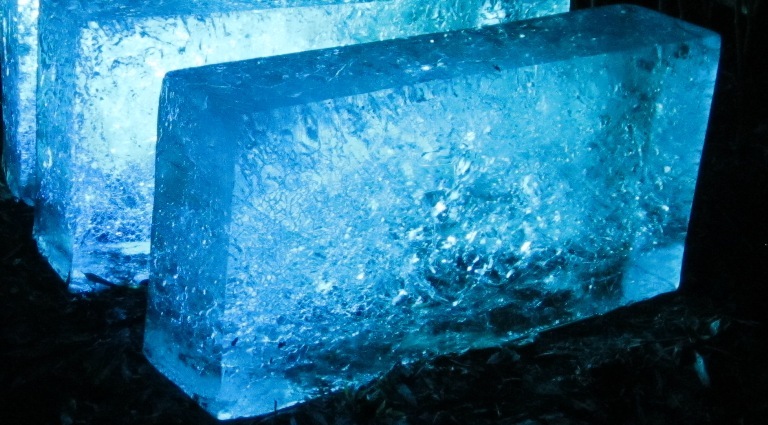 I have been thinking about ways that you could recreate the look and feel of the light shining through the ice, ways that would enable you to use something similar at all times of the year. Perhaps you could use plastic or glass or another material to replicate the look of the ice, my head is simply buzzing with ideas! If you get chance to pop into Wisley over the weekend, do go and take a look. The illuminated trees look really amazing and as an added bonus, which I assume is the case every night, they are serving complimentary mulled wine in the shop to help warm you up again!